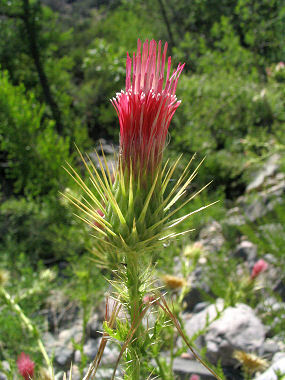 Arizona Thistle is a member of the Sunflower Family. It typically may be found growing along roadsides and in clearings in ponderosa pine forests at elevations between 3000 and 7000 feet. The thistle grows to 4 feet in height and has green, hairy leaves to two inches in length with spiny edges and tips. Native Americans used thistles medicinally. The plant can bloom anytime between May and October and produces a bright red funnel shaped flower to 2" in length.